ISLAMABAD: (APS)September 7, 2017-Italian government & UNESCO signed an agreement of 1.7$ billion dollars for the project of right to education of child girls and safeguarding of Pakistan culture & heritage in Pakistan. In the meanwhile Italian ambassador to Pakistan H.E Stefano Pontecorov, Ms. Vibeke Jensen UNESCO representative signed the MOU and share the documents. Signing ceremony held at UNIESO office Islamabad Thursday 7 September. In this occasion minister of federal education Pakistan Bleegh ur Rehman were also present and he was the chief guest of signing ceremony. Bleegh ur Rehman said that ‘’ he is very thankful to Italian government and UNSCO Pakistan officials to take keen interest in Pakistan education system and they want that Pakistani girls also compete with world education system and I am feeling great that they choose selected areas for project and I hope that we will complete our aims soon as possible and I m also invited to others western countries to take initiatives for educational system in Pakistan and also make easy education policy and exchange the students with different universities and institutes’’. The project is divided into two components one is 1.4 billion dollars for education development and second is remain amount for culture and heritage sites improvement and explorations. In this project Italian government funded and UNSCO is implemented body. The first component of this is project is work on child girl’s education in 12 different cities in Pakistan. Which aims to support the efforts of government of Punjab & Khyber Pakhtunkhwa in increasing access, retention and improving the quality of girls education through capacity building and targeted interventions at both institutional community levels. The second component is aimed at supporting the efforts of the government of Pakistan in the protection of cultural heritage and enhancing the role of youth and communities. UNESCO will undertake awareness raising activities among general public and specially focus on schools going youth and teachers. The entire four provinces will benefit from the interventions of this component of project. 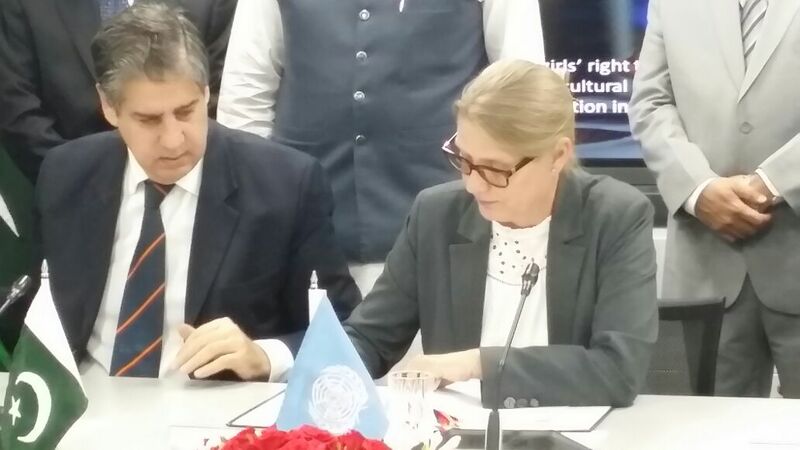 At that occasion the representative of UNESCO, Ms. Vibeke Jensen said that ‘’ we are selected district Sawat in Khyber Pakhtunkhwa and Bhawalpur district from Punjab and these two cities is our main focusing area and Italian funds allow us to expand our ongoing girls right to education interventions to more districts, and we are deeply grateful to Italian government for this agreement’’. In the ceremony the Italian embassy officials , UNISCO Pakistan team members , Ms. Santa mole head of Italian cooperation and Syed Junaid akhlaq secretary, ministry of information , broadcasting and national heritage and media representatives were also attended the signing ceremony .